Ride UK caught up with Deluxe and Crucial BMX‘s Alex Boyd for their next round of 30 Seconds. Check out some trails goodness in this one! If you caught my Frostbike coverage of Deluxe and And Forks there’s a good chance you got a preview of this bike . After Frostbike wrapped up, Jeremy Ball was able to take home the bike that Deluxe and And Forks had on display for his personal setup. You can get a closer look at this super dialed setup right here. Also… If you notice the brakes on that bike… We’ll have a review of them up soon! Spotted this gem over on Can You Dig It. Check out Deluxe‘s Dylan King putting in some work with the shovel then proceeding to blast through the woods at a few different spots! Hell yeah! 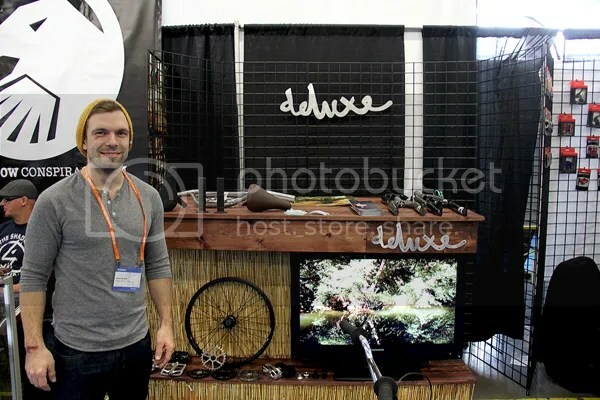 Keeping things rolling, I made my way over to the Deluxe BMX and And Forks booth where U.S team rider, Jeremy Ball, was taking care of things. Deluxe have a few fresh items for 2013 and the And Forks range is finally available, so that was cool to finally get a look at those in person. Let’s take a closer look! Check out this new video that Deluxe‘s Mark Potoczny put together from his time at the L.E.S trails in the Czech Republic. Trails goodness! Since Deluxe‘s Jeremy Ball is stuck in the Midwest like me, his only option this time of year is to head indoors. Check out this fresh helmet cam video of him getting some time in on the Skatezoo mini spine ramp. It’s a fun ride. Turns out I was a little off with the roman numeral system for the past few editions, my bad. I’m terrible with math… and apparently ancient counting systems, haha. EITHER WAY… For the 44th edition of Products, we’re taking a closer look at the Cult Deathrow frame, Eclat‘s Dynamic front hub, Deluxe‘s new “Trust In Dirt” trucker hats, Madera‘s Unity front load stem and Diamondback UK‘s Remix complete bike! Let’s get into this!